As most U.S. stamp collectors know, the United States Postal Service issues an annual album that contains that year’s commemorative postage stamps. This year’s collection is no different with stamps that honor such famous figures as Harvey Milk, Charlton Heston and Shirley Chisholm – as well as notable events in U.S. history from the War of 1812 to the Civil War. In addition to the stamps, the stamp yearbooks also contain biographical information about the subject and a place where collectors can mount their stamps. But there is one stamp that is not included in The 2014 Stamp Yearbook: the Jimi Hendrix issue that was released earlier this year as part of the Music Icons series. As previously reported by the philatelic publication Linn’s Stamp News, the omission was due to a permissions issue (The business affairs of the late guitarist are handled by Experience Hendrix). 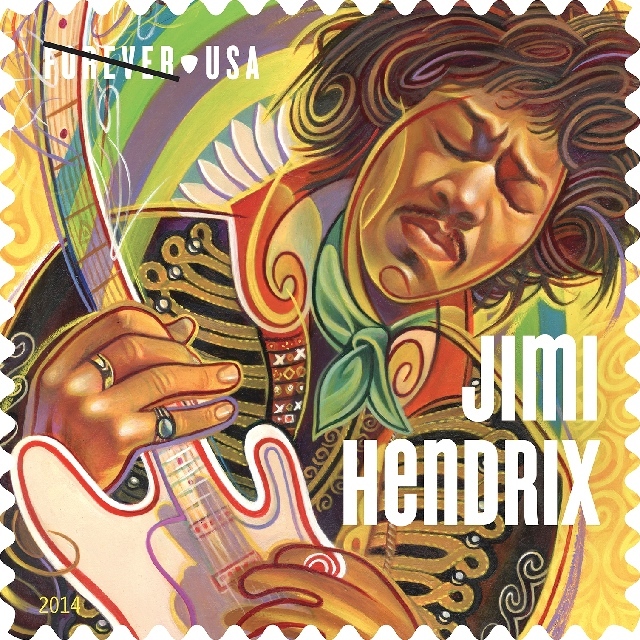 Permission to include the Jimi Hendrix Forever® stamp, issued in 2014 as part of the Music Icons series, could not be obtained before going to press. With a likeness of Hendrix designed by Rudy Gutierrez, the stamp came out this past March around the time of the South by Southwest Festival. Still, the Music Icons series is represented in the stamp yearbook with another ’60s legend—singer Janis Joplin. The 2014 Stamp Yearbook is currently on sale for $64.95 and available to order here.